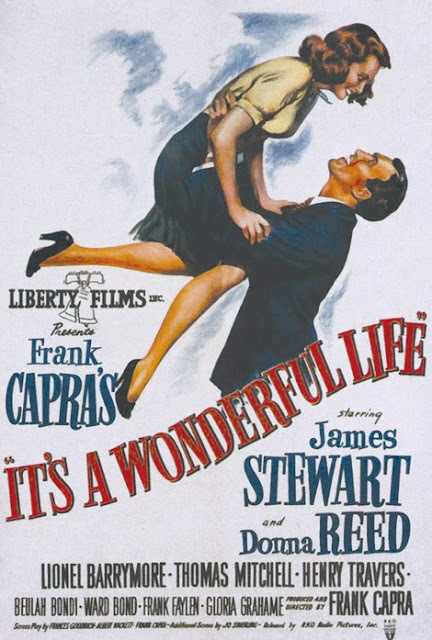 It's A Wonderful Life (1946) is a Christmas classic rivaled only by Christmas Story and Miracle on 34th Street in holiday television airtime. On Christmas Eve, many denizens of the town of Bedford Falls pray for one man: George Bailey. In the heavens, several stars speak to one another about this incident and summon Clarence to prevent him from committing suicide. First, Clarence is given an overview of George's life. George longs to travel and go to college, but life has other plans for him. A reversed Christmas Carol about a poor man who's done the right thing all his life gets supernatural help on Christmas Eve. The film covers George's life in key moments; most of which involve the happiest days of his life turning sour or his dreams being delayed by duty. The moral is that a good life will be rewarded with great friends and family. This film also introduced the idea that every time a bell rings, an angel gets its wings. George Bailey has only ever longed to see the world, but after his father passes away, finds himself trapped in his tiny hometown. George is bound partially by duty to his father's memory, but more by his conscience regarding the very real possibility that he can make his town better. The best part is that George is no saint. He's a bit of a do-gooder, but has his dark moments. The most compelling of which comes at the film's climax, right before he contemplates suicide. In fact, much of the third act involves the character being run ragged. Mary Hatch is a childhood friend of George's. She's spunky and charming and a great match for George. The film provides enough doubt about them ending up together that the audience winds up rooting for them when they get stubborn. There is one small issue in the film: how does George never being born affect Mary's eyesight? In the alternate universe where George was never born, Mary is a spinster who work at a library and wears glasses, perhaps eyestrain? Uncle Billy Bailey is the nutty uncle with a heart of gold. After George's father dies and George takes over the family's savings and loan, he keeps his absent minded uncle on as a clerk. His uncle is largely on the periphery and his nuttiness is only shown. He keeps several strange animals, including a raven in the office. Clarence is the guardian angel, second class, who is sent to prevent George's suicide. He's humble, if bumbling, and is willing to take quite a lot of punishment to save George. He also wants to get his wings, but that almost seems unnecessary in the light of his selflessness. Mr. Potter will do anything to make a quick buck. He's out to wring the town for every dime its worth. He's a more realistic scrooge. An unrelenting money grubber who'll do anything to get ahead. Definitely a banker for the modern era. George and Mary's song, "Buffalo Gals," has not aged well. It is played at least three times throughout the film and gets incredibly annoying by the end. It doesn't help that Jimmy Stewart is not a great singer. The city is a great representation of small town America. From the Great Depression to World War II, the film covers some legendary periods in American history without really explaining the larger events since everyone at the tome knew them. Kids today should watch this for the history lesson alone. A Christmas Miracle shows George his life's true worth. This film is definitely a product of its time. Over two thirds of the film is devoted to showing George's life leading up to Clarence's intervention. This may be a bit long for some viewers: just watching the ups and downs of a man's life. In a modern film that would probably be twenty to thirty minutes of a three hour run time at most. However, there is a great spattering of humor and darkness to keep people interested through the start. Once Clarence pushes George into the alternate timeline, the film speeds up to almost breakneck speed. The story stands as a testament to the ability for one man to build a town through good deeds. This Christmas classic has a few errors, some questionable choices and some older pacing, but it remains necessary Christmas viewing.